So, I finished up Lovingly Alice by Phyllis Reynolds Naylor! It's Alice's 5th grade year and things aren't going so well. First of all Sara moved away without telling everyone-- rumor has it her family has been evicted. And everyone's being mean to Rosalind because she's fat. Things just go down hill from there. Hey, your a Reader of the Hour and so am I :) You're doing awesome...isn't this fun? Just stopped by to show my support :) I know you're probably getting tired by now! Nice choice for your book. I really enjoy reading YA and Youth books too. I have two in my stack, Pictures of Hollis Woods and Emily's Runaway Imagination. Have fun! Glad to see others are reading kids books. By the way, what is a "counterfeit librarian"? Keep up the good reading. Your doing well! Congrats on joining me and Wendy as Reaser of the Hour! I read several of the Alice books when I was working as a children's librarian. It is a great series! Congrats on being the reader of the hour!!!! This is such a great read-a-thon!!!! I had a roommate lined up in college who transferred and never told me - that kind of thing does sort of start out your year badly even when you're very nearly a grown up! LOL! Will you be reading other books from the series? Congrats on finishing a book! Keep it up! i am partial to coming of age type stories. esp. featuring young girls. this sounds good. a bit like Blume. re below: i'm also fond of As I Lay Dying. Sounds like you had a talented teacher who knew how to engage his students. I believe Faulkner would have improved as I think he was often intentionally irreverent and a lot of giggles reside in irreverence. Nice work on the reading, and this book does sound perfect for this event. Keep at it! Keep on chugging! This is the best way to spend a Saturday that I can imagine! Hi, Jennie! 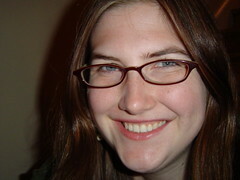 I don't remember how I first found your blog, but I've been linking to you for awhile from mine. Your pre-readathon review of some of the "Once Upon a Time" books prompted me to put a couple of them on my TBR pile for the read-a-thon. I'm hoping at least to get to "The Storyteller's Daughter," and I also have "Snow" by Tracy Lynn. Wanted to leave a note of support, you're doing great! Being Reader of the Hour was totally fun. 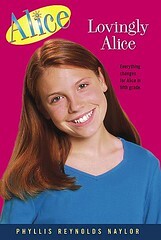 I'll be reading lots of Alice books today and she is similar to Blume. These books sound great (I *loved* Judy Blume as a kid, maybe I'll have to pick up the Alice books as an adult ;>)). Keep reading, I'll try to check in later to see how you're doing.